The Sofia + Sam Laptop Bed Tray is a great addition to any bed, sofa or chair. The tray allows you to eat or work on your laptop from the comfort of your own bed. Once you're finished working, store your pens or computer mouse in the convenient storage drawer. The adjustable tilt section and removable stopper allows you to prop up your favorite book to read. Weight: 5.5 pounds. 9" tall with legs pulled out. 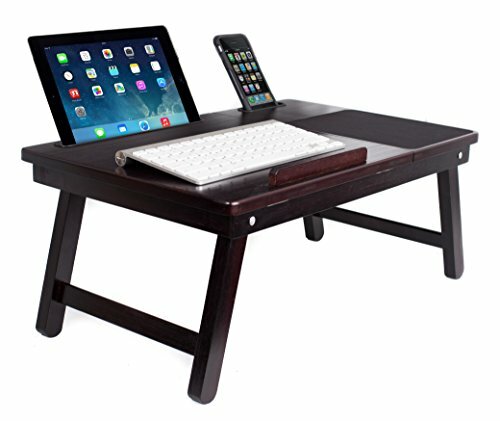 LAP DESK TRAY TABLE: The tray table accommodates laptop computers up to 18". Integrated storage drawer. Foldable legs for easy storage.